Master This Rubber Stamping Technique & Learn How To Be A Watercolour Artist. Ann Craig Shows Examples And Provides Hints That Help You Succeed. 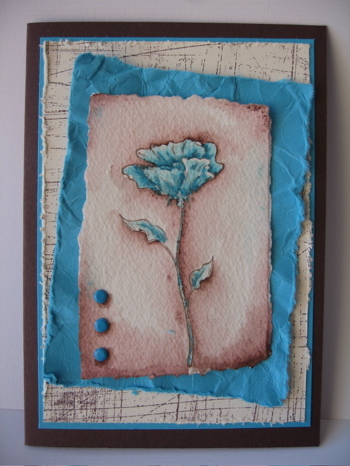 By using Rubber Stamping Techniques such as Water Colouring you can create beautiful pictures, individual cards, and lovely unique embellishments for your scrap pages. 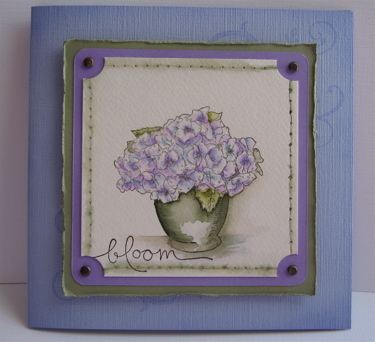 Stamping is so versatile - it allows you to become an instant artist. The really great aspect of Rubber Stamping combined with Water-colouring is that you use artist quality products like pressed water-colour paper. either a wet brush or Aqua Painter (a brush with an in-built water well), a colouring medium (Stampin' Write Markers) and a stamped image. The stamped image removes the tension of wondering whether or not your image will be "good enough", so you can develop your painting style while relaxing and creating beautiful projects. For this technique you will need the following supplies. Let's look at some examples so you can follow visually, while I explain the process of this very relaxing Rubber Stamping technique. Choose a suitable image that allows sufficient room to "colour in". Stamp the image using either Stazon, Basic Black or Basic Brown, onto the dry water colour paper. Decide on your colour range. In this example using a stamp from the "Bloomin' with Beauty" Set in the new Stampin Up Mini Catalogue, I have used Pixie Pink and Sahara Sand Inks, Very Vanilla and Sahara Sand Card stock and black Stazon Ink. 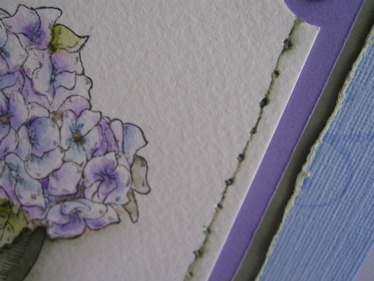 I have also used the ever useful "Sanded" Background stamp for the border or frame of the flower. The edge of the frame was distressed with the tool from the Cutter Kit before being raised up on Stampin' Dimensionals. Apply a small amount of Pixie Pink (or your chosen colour) with the brush tip of the Marker, to a shadow part of the petal, and immediately blend it with the Aqua painter. Leave some highlight areas of white paper - this will give your painting "life". It is important to work on a small section at a time so that the ink from the Marker does not dry before you apply water, otherwise you may have strong lines of colour that don't blend too well. As the ink dries, the colour will fade a little, so you can work back over some areas to obtain more strength if desired. HINT: To help lift the image from the page, apply a little grey outside the outline of the image. (I used the Sahara Sand on the pink flower and Chocolate Chip on the Turquoise flower). In the detail photo you can see the wonderful texture of the w/c paper, the subtle variety in the tints of colour (achieved by using more or less water) and the effect achieved by softly outlining the image. 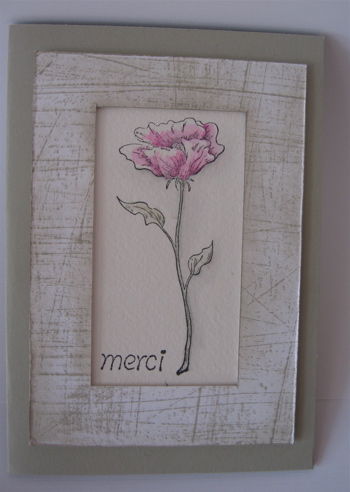 I want to acknowledge the influence of my friend and fellow demonstrator Vanessa Webb, for the design of the pink flower card. I saw something very similar on her blog - loved it and stored the idea away for later use. 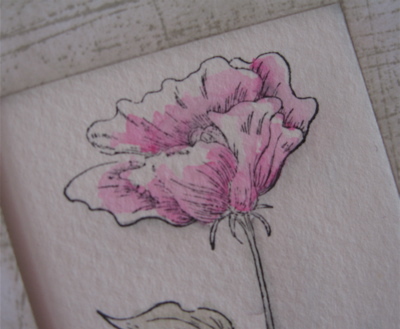 The next images show the same floral stamp, using different colours and a more casual layout. 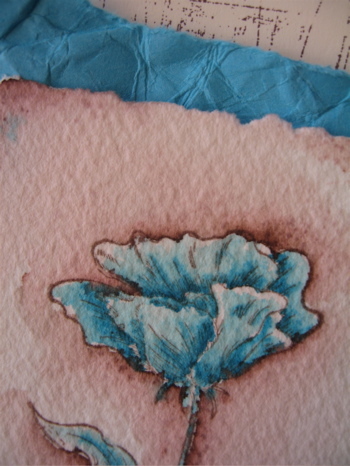 I have used the method of "scrunching" the turquoise backing card, and then distressing the edges with the Stampin' Up! Cutter Kit. The addition of some Turquoise brads from the Bold Brights Brad Selection helps balance the angle of the backing card, and the use of the "Sanded" Background stamp compliments the textural feel of the entire card. This was my solution to the July Colour Challenge I set my team - Turquoise, Chocolate Chip and Very Vanilla. I find that using just a couple of colours keeps the finished product simple, thus showcasing the image more effectively. Here is the same rubber stamping technique applied to another image from the Blooming set. All Art work by Ann Craig. All Images copyright 1990–2008 Stampin’ Up! You can complete similar cards using this beautiful Rubber Stamping Technique, by ordering the Stampin Up products from me. Just complete the form here. Black Stazon Ink OR Basic Black In Pad OR Basic Brown ink pad. If you would like further information about this technique, or would like to place an order for Stampin Up products - fill in this contact form to specify your request. I will reply to you promptly. Return to Rubber Stamping Techniques to see other ideas.